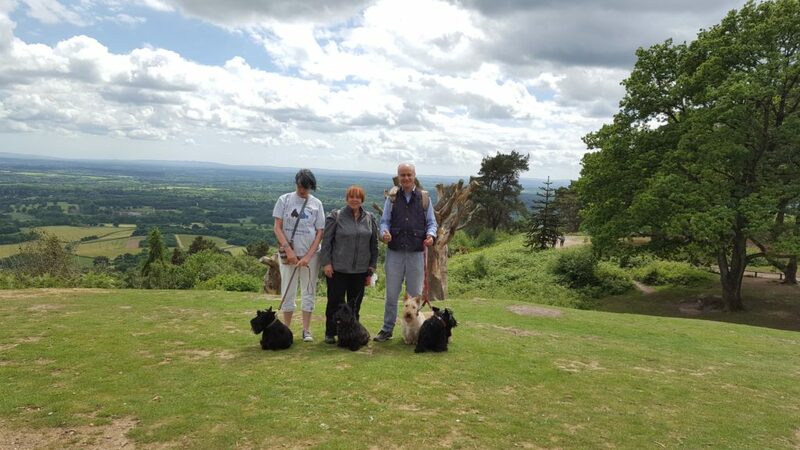 For those of you who took a punt on Sunday turning out to be a nice day for a picnic and worthy of walking your Scotties in the Surrey Hills, you were roundly rewarded with just that. Our thanks to LSC member Ian Marshall who suggested the venue for our most ambitious trip so far. Having attempted Hyde Park in central London in January, for mid-year we opted to climb Surrey's highest point, and an hour's drive from West London which is where everyone in the meetup was from this time. Many of you who could not come kindly dropped us a note, thank you. So for you who wanted to be there, a quick report on the event. 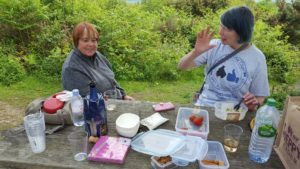 We met in the carpark detailed in a recent email and we began by using our new WhatsApp group to stay with others. The new messenger group is a boon especially when in the final hours before a meetup everyone is already out and about and need something easy and portable. Aerial shot from top of Leith Hill Tower. Did they have altitude sickness below too? Without SatNav it would have been a challenge to find, as some discovered on the day. 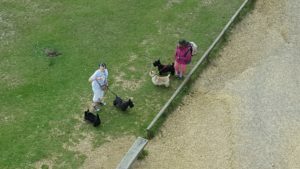 But we managed to progress, with the likes of meetup veteran Scotties like Captain and Ben as well as Pudding and Pikush, to the Leith Hill Tower. Landing nearby we had a picnic which included Thai spring rolls, strawberries, and some English sparkling wine. That was that Scotties. No only joking, but they did get some nice nibbles too. After lunch the threatening clouds had dispersed and we had a sunny afternoon of it, visiting the Tower. From the top of this fine structure you are actually higher than at the top of London's Shard building, which you just about see on the horizon too. 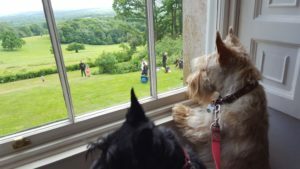 We then took a second woodland walk, this time in search of Leith Hill Place. This National Trust venue was the childhood home of one of Britain's most famous classical music composers, Ralph "Rafe" Vaughan-Williams. I had no idea that he had links with the Wedgwoods. At least he had no chip on his shoulder, pun intended. 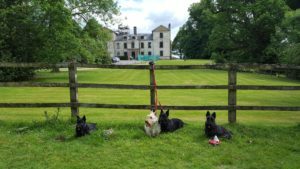 The house was a splendid find, not least of all because our Scotties were all welcomed inside! 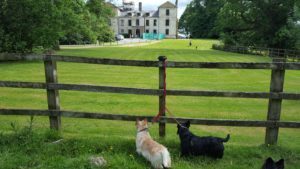 The rascals were able to survey most of the house and were even allowed into the dining area while we adults enjoyed some rather nice tea with scones and ginger cake. All very civilised. There are also several photos of Rafe when he was in the British Army in 1915, mostly take in frontline battle zones like Saffon Walden in Essex. Okay another joke I think. A very charming home which although dating from Jacobean times was in fact refaced in a Palladian-style about 1760 by Richard Hull. Rafe himself, having grown up in that house, inherited the house many years later and in 1944 gave it to the National Trust. We managed to get back to the car park bang on 5pm as planned. It was a longer meetup than common, but well worth making a Sunday of it. They seriously gonna let us in? Many thanks to everyone who came. And there are plans to make the July event even more ambitious! Those of you who are Full Members will receive details of our next venue via email, as well as updates with useful things like map set via WhatsApp. The WhatsApp group is free for Full Members but you have to give us your consent to include your phone number in our group. Why not become a Full Member today?